Regardless of what you photograph and for what purpose, if you are going to make money from your images, the technical quality has to be perfect. Stock libraries will examine your work at 100% to check for any problems with the technical aspects and reject any that don't meet their standards. Commercial clients will expect similar levels of quality of your work and any prints you wish to sell must be technically perfect as errors will ruin a print. You therefore have to be aware of what those standards are and ensure your work meets them before you submit them for stock, to a client or to sell as a print. Lets take a look at some common issues. Not the type that you hear, more the type you see. Noise is the name given to the speckled patterns introduced into your pictures when you have used a high iso such as 6400 or when you have dark areas where there is not enough light such as in shadow. Noise is a big reason for stock submission rejections and a commercial client would be most unhappy to see images submitted with noise. 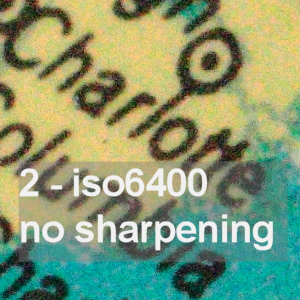 Take a look at example image 2 where we have a section of a picture of a globe shot at iso6400 and viewed at 100%, i.e. full size. Compare that to picture 1 which was shot at iso100, a very low iso where noise is all but illiminated. The speckled coloured noise is obvious and greatly degrades the quality of the image. So what can you do to avoid noise? Avoid high iso's if at all possible. Modern cameras are now much better at shooting in low light but there is always a point where the iso introduces just too much noise. You will have to experiment with this to see how far you can go but remember to always view the results at 100% to see how good or bad it really is. Only at 100% can you see the true state of play. If you are forced to shoot at high isos, say you have to photograph a floodlit football match at night where you need a fast shutter speed to capture the action, then you can adjust the image using software in post-processing however this can lead to a reduction in the sharpness of the image. Perhaps though the loss of some sharpness is acceptable enough for the reduction in noise. Most images benefit from some sharpening but there's a fine line between effective sharpening and taking things too far. Over-sharpened images are another big reason for rejection to stock libraries as sharpening artifacts as they are called are ugly so should be avoided at all costs. 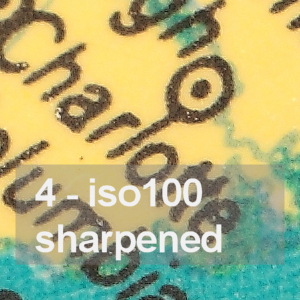 See image 3 for an example of how bad those sharpening artifcts look. 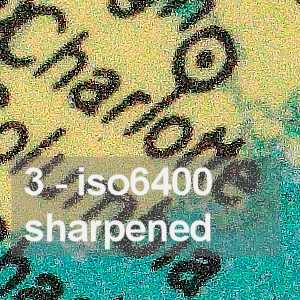 For comparison image 4 is shot at iso100 and has the same amount of sharpening applied as in image 3 so by using a high iso and over sharpening we are introducing artifacts. Of course there may be times when you have to shoot at a high ISO in order to get the picture. For instance you might be shooting a football match where high shutter speeds are needed. There are a number of ways to reduce noise in your images that start with in-camera settings right through to how you process your finished images. You can also help the quality by shooting raw images rather than jpegs and only create the jpg after you have processed the raw image to remove as much noise as possible. There are a miriad of cameras and manufacturers so describing how they deal with noise is not possible in a single article like this instead we suggest you investigate the tools your camera provides to manage noise reduction. It's worth understanding if and when you switch it on or off. Using the in-camera options can at times actually give you a lower quality image than switching off in-camera tools and instead using post-processing techniques. Also consider using raw rather than jpg files as raw retains much more detail and information that's lost in the compressed jpg. Time to consult the manual! When you buy a camera you will almost certainly get basic but useful image processing software from the manufacturer. These will take your images and allow you to apply basic adjustments to the image which includes brightness, contrast, sharpening, noise, chromatic abberation reduction, etc. There are too many tools to mention every one that's available so we again suggest you investigate what you have. You can buy a number of products to improve noise reduction in your images and most image processing software products will feature their own tools too. To get the best from your photographs it's important to understand the settings and tools right from the capture of the image in-camera to processing the files on your computer. Don't assume the defaults will give you the best results and always consider shooting in raw for maximum quality and adjustment. 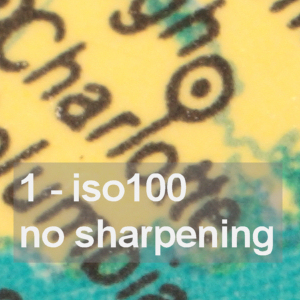 Remember, to avoid those sharpening artifacts use less sharpening and/or a lower iso. Exposure is where you decide how much light you use to capture the scene you wish to photograph. If you let too much light in you over-expose your picture as in example 7. Use too little and you under-expose as in example 5. 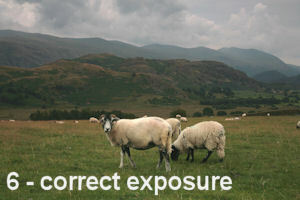 However if you get it right you capture using the correct amount of light as in example 6. Actually though you might want to under-expose or indeed over-expose your pictures because that's the effect you're after. If though you are submitting your images to a stock library then you have to hope they agree with your creative vision and allow it through their inspection process. Let's take a look in a little more detail at what is happening here when we under or over-expose an image. Starting with under. This means we have not allowed enough light in to the camera to capture the scene so it's very dark. Look at example 5 you can see the hills at the back of the picture are very dark where only the very lightest parts stand out. What we can do here is look at an exposure setting and compare against the other two pictures. So this could have been shot using F8 and 1/60th. To get the correct exposure we would have to allow either more time, say 1/30th or let more light in with a wider aperture, say F5.6. We could go too far and let too much light in as in example 7 where the exposure could be F4 or 1/15th. 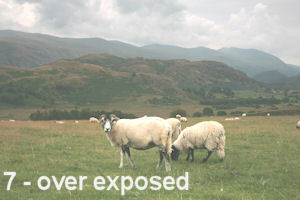 You can spot an over-exposed image because the highlights like the sky or the back of the sheep are much brighter than the correctly exposed image. Of course you can manipulate your images when you get back to your computer but if you over-expose then you can lose detail in those highlights and no amount of adjustment will bring it back. 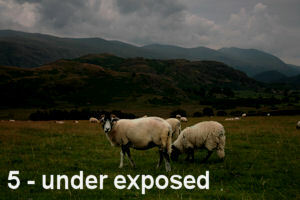 The same applies to under-exposed shots as detail is lost in those shadow or dark areas. What you are looking to achieve is to retain detail in the highloights like the sky and the darker areas like the hills in our example. If you have the time, when you are shooting landscape for instance, capturing the scene with different exposures (or bracketing) will ensure you record it correctly in at least one of those pictures. Eventually experience will tell you how much light to use. You can also use graduated-filters to under-expose parts of the scene like the sky whilst still recording the rest of the scene correctly. You achieve sharpness by adjusting the focus ring of your lens. That is if you actually do it yourself. Auto-focus on your camera will indeed do a good job of finding focus for you. Just ensure you point the camera at the right place in the scene. Lets look at some examples of correct and incorrect focus. Image 8 shows a section of the image 10 when seen at 100% or full size. This is what sharp looks like. All detail is unblurred. Compare that with image 9 which is slightly out of focus. Whilst at first glance this looks to be as sharp as image 8, look closely and you can see the white of the % symbol is very soft at the edge, also the black areas around the edge of the button are clearly blurred when compared to the sharp image. To be fair this is only very slightly out of focus however it does demonstrate the difference and you should always be aware of what is and what isn't in focus in your picture. Remember, where images are being subjected to a review prior to acceptance such as in a stock library submission, sharpness is critical. If there's any doubt then it would be my opinion that the image would be rejected, no matter how great it is. Note these images haven't been sharpened in post. This is the default of the image straight out of the camera. Trying to sharpen an image that's blurred in the first place is unlikely to work but it does depend upon how out of focus the image is. Sometimes you can get away with it and end up with a useable image. Other times, it's probably best to not to bother as it's always going to look soft and out of focus. It's very hard to rescue an out of focus image in post production so always ensure your focus is correct when you capture the image and save yourself some heartache later. It's always the best shot that's slightly out of focus! This is similar to blur or out-of-focus as the image isn't sharp but the cause is very different. Look at our example image 11 you can see there is a 'ghost' image caused by movement of the camera whilst the shutter was open and using a shutter speed that meant camera movement impacts on the image. To remedy this you have to ensure your camera doesn't move whilst you take the picture. The ultimate solution is to use a tripod and don't hand-hold the camera. You can then use any shutter speed you like to capture the scene. For times when you have to hold it, then use a shutter speed such as 1/60th or faster to ensure camera shake doesn't ruin the image. This seems to cause a lot of confusion amongst photographers who are new to submitting images to stock libraries but actually it's quite simple once you understand how it works. Lets say the minimum image size is 4mp which means 4 megapixels which is 4 million pixels. To calculate how many pixels are in your image multiply the length, in pixels, by the height, also in pixels. 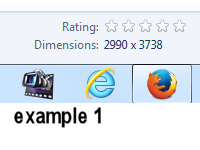 An example a picture of 1400px (Length) x 1100px (Wide) = 1,540,000px which is too small. A bigger picture with dimensions of 2500px x 1750px = 4,375,000px and meets the spec. So how can you quickly check the dimensions of your images? If you are using a Windows 7-based computer, find the image you wish to check and simply click on it. At the bottom of the screen you should see some details about the picture. Amongst them is 'dimensions' See the example 1 to the right. You can also right-click on the image, select properties and then select 'details' tab. Down the list you will also see dimensions. See example 2 for a look at a typical 'detail' screen shot for an image used on this website. 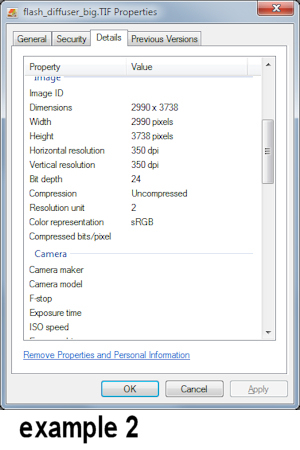 Note the dimensions and multiplied-out values do not equate to the file size as that differs dependent upon how much information there is in the picture file. For instance, a picture of mainly white would be a smaller file than one with lots of colours because the whiter file has less information to store. If your white balance settings are wrong your image can have a very strange colour cast, the strength of which will depend on what settings you had on the camera and what type of light your picture was shot in. Sometimes any error here can be marginal and almost unnoticeable. It's not until you correct the white balance do you realise that it was incorrect to start with. Different light sources create different colour temperature, measured in k or kelvin, so each has to be considered when taking your pictures. Tungsten light, from lightbulbs for instance gives off a yellow light, daylight is quite blue and fluorescent lights are green. The human eye doesn't really notice them but your camera does. The white balance setting ensures that your images take in to account the colour temperature of the light you are shooting in and adjusts the image accordingly to accurately reproduce the colours in your image. As mentioned above selecting the wrong option will mean your pictures aren't accurate and this can be very important especially if you are shooting products or models for a commercial clients. Landscapes too can be ruined by that cast. So what can you do to ensure your colours are accurate? Firstly, you can buy a colour meter that measures light temperature and will give you very accurate settings to use in camera. These are expensive though so perhaps to start, one of our other options might be better. So, using the controls on your camera, select the white balance manually. So if it's a cloudy day, select the cloudy option, or if you're shooting under tungsten light then select the tungsten setting. On many cameras you can also take a photograph of a grey card and tell the camera to use that as a the basis for deciding what the colour cast is and set the camera to your custom white balance. Obviously consult the camera's manual to work out how to do that. Another option is to shoot raw files rather than jpg's. This allows you to select any white balance you like when you process the images later as the colours in the picture an be changed easily. If you shoot jpg's then the colours are set and can't be changed as easily as they can when you shoot raw. You can still take a custom whote balance reading for both options here but the raw file gives you more flexibility when you are processing your images later. It can be very useful to have a reference for colour balance to use later when you process the images on your computer. I use a gray card or a pure white card photographed under the same light as the subject which gives me a reference to use later. During post-processing I can refer to that image and use it to define the colour balance adjustment for all of the images from that shoot.